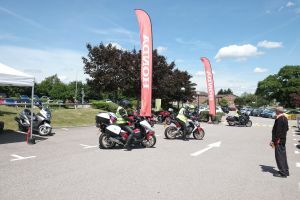 Honda (UK) continues to support Ride to Work Week by encouraging staff to take part in a series of two-wheeled activities at its head office in Bracknell. As part of Honda's efforts to encourage lapsed riders to reignite their passion for biking, Honda put out a call to staff to ride at work during Ride to Work Week. By day two of the week-long event, Honda had already seen a number of riders of all experience levels try out a diverse range of motorcycles, including the iconic GL1800 Gold Wing, A2 licence-friendly CBR500R and dual-clutch transmission-equipped NC750 Integra. "We've deliberately offered a chance to ride the latest bikes in the Honda range to colleagues who hold a licence but have got a bit comfortable with the climate controlled, radio-fuelled, Berkshire traffic jam experience. "These people have now had a reminder of what they're missing and some have already been talking about their next commuter bike." Now in its 17th year in the UK, the annual Ride to Work event, organised by the Motorcycle Industry Association (MCIA), aims to create awareness and encourage more people to consider the many benefits of commuting on two wheels. The MCIA recently commissioned a survey showing that the top three reasons people ride to work were due to shorter journey times, cheaper transport and the only way to avoid congestion. Recent studies indicate that all road users would benefit more if commuters switched from cars to motorcycles or scooters*.